This item requires custom fitting and is only available through your doctor with a prescription. MaxTrax ROM Air Ankle is designed to increase stability following trauma or post-operative procedures. The cushioned inner/outer soles designed to absorb shock upon heel strike and improve patient comfort. The low profile, Rocker bottom helps promote natural gait and reduce plantar pressures. Provides protected range-of-motion following trauma or post-operative procedures. ROM settings between 45 degrees plantar-flexion and 30 degrees dorsi-flexion in 7.5 degree increments. Uprights will lock in fixed positions of 0, 7.5, 15, 22.5 and 30 plantar- and dorsi-flexion. Always consult with your physician or therapist before making changes to the brace. If you experience any pain, swelling, sensation changes, any unusual reaction while using this product, consult your medical professional. Shop our complete selection of walking braces or browse additional DonJoy products. We are looking for a walking boot to help flex and extend the range of motion for my wife who has lost a great deal of the rom in her left foot. 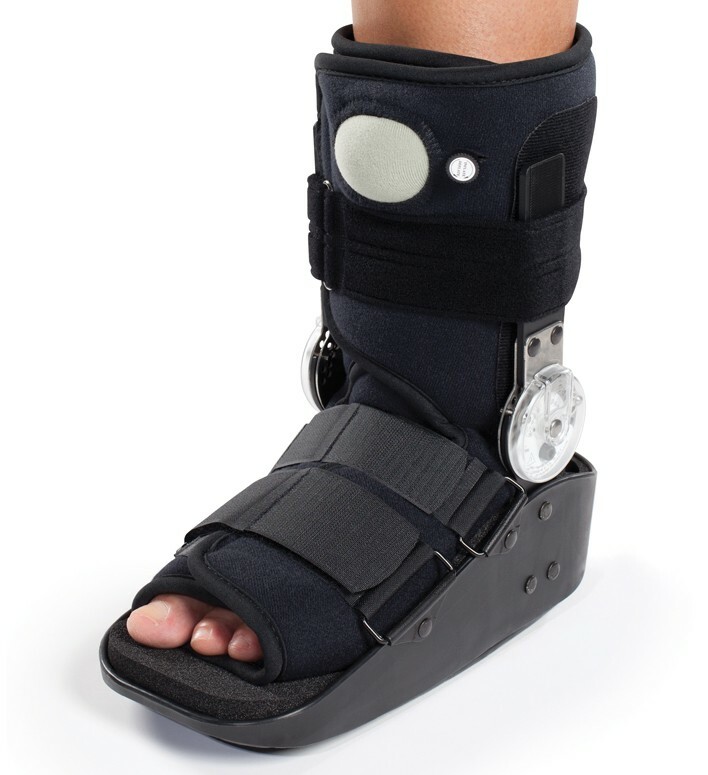 Can you lock this boot at a certain degree to help stretch and gradually regain the natural rom by gradually increasing the degrees and locking them to help stretch the tendons. Can you wash the foam part in the base of the boot? If yes, with what? The liner you can hand wash with mild detergent, the Foam Pad on the base of the boot, I recommend wiping that area with a cleaning wipe. Should the heel sit all the way back in the boot? yes, this this is correct, the heel should be all the way back in the boot. can you wash this boot? The Maxtrax liner can be removed and washed in the sinke by hand with lite detergent. Then let it air dry. Be careful when putting the liner back in the boot becuase the velcro on the supports is very aggressive. Does this mean that this model only locks in these positions or does the piece allow it to move while walking for a fuller range of movement with the protection of an aircast? You can lock it out in those positions or you can allow for controlled range of motion at those positions. It's very similar to an IROM hinge. For example, you could set it to allow 15 deg of dorsi-flex and 30 deg of plantar flex.